TheraApp includes 32 speech therapy apps that are aimed to help students with their articulation, receptive and expressive language, auditory processing, reading, cognition and problem solving, and social skills. Each activity set offers multiple levels of difficulty and motivational games, making speech and language therapy fun and engaging. 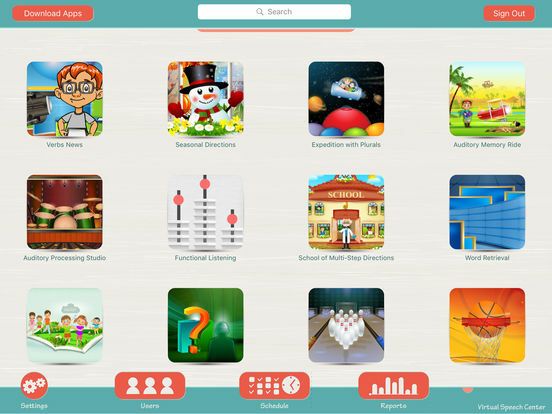 Our articulation apps include professionally recorded audio recordings, flash cards, memory games, bingo games, and other built-in and motivational games (e.g., carnival games). Students’ productions can be audio recorded and played back as needed. Our language and cognitive apps include professionally recorded audio, flash cards, built-in games, and motivational games. You can introduce background noise and audio record students’ responses. Our language and cognitive apps target auditory comprehension and memory, vocabulary, “wh” questions, English tenses, syntax, sentence structure, sequencing, categories, word retrieval, pragmatic language, problem solving, high-level thinking and reasoning, and reading.